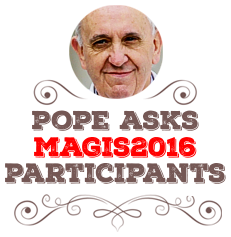 What did you want to tell to Pope Francis? all of them, at the entrance of their tent. Thus the Lord used to speak to Moses face to face, as one speaks to a friend. Imagine that you met with Pope Francis. and now he wants to hear something more from you. What would you like to say to him? What would you want to ask him about? you can tell God Himself equally well. A dialogue is a conversation. Listen to your heart now. It’s in it that God wants to speak to you.